My capacity for stressing myself out knows no bounds, honestly. First I came up with the idea for a fall cardi knitalong last spring so as to have a fighting chance at a new cardi this fall, and then I started knitting shawls and socks instead till - well. If you live in a part of North America where seasons have significant shifts, you'll probably have noticed one is happening right now. I have noticed because I'm cold a lot more often than I was in July. And the Fair Isle sweater I started last winter is almost but not quite ready for the yoke. 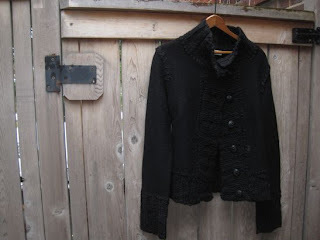 And my beautiful cardi, for which I made a matching shawl in anticipation, is still missing the top of its back, two sleeves, and all its finishing. Meanwhile, all I seem to be able to get my hands on are nice compact sock projects because I'm not getting a second to sit on the sofa with any of those bigger brain-requiring projects. 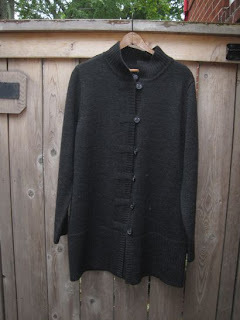 Yesterday I had a sudden inspiration and spent one hour - you read that right - conjuring not one but two perfectly fitted 100% wool cardigans for less than the price of the yarn for one. Yes! And how you may ask did I achieve such a magical transformation in the warmth potential of my wardrobe? Three words: discount department store. In Canada: 'Winners'. In the US: 'Marshalls'. This beauty is keeping me warm as I type. Okay, I know it looks a bit blah but imagine how much more so it would be on your needles! I'm guessing it'd take 3.0mm plus forever because it falls to about 3 inches above my knees. You would never knit this sweater, and neither would I, because it is boring charcoal grey and has nothing to break up the stocking stitch. But you would wear it because it is warm and soft and sleek and will go with everything from black to screaming pink. Also, surprisingly flattering. I know. It looks like nothing on the hanger, but on a body: pretty fab. If only it had pockets. This one is too cool for my Mary Janes (I tried, oh how I tried.) And you would never knit it either. You know why? Because it is mostly boiled wool, cut up and sewn together. Stitches got picked up for the cuffs and collar and button band in a thick and thin yarn also used for the blanket stitch edges. Also: it is black. A plain black cardi is a total bonus in your wardrobe but in your knitting bag? This way leads to blindness. Or at the very least madness because you cannot fail to notice all the fabulous colours available to knitters these days. Conclusion: go me! now I can knit without freezing, and with luck I'll have those sweaters done by First Snow.